2. Long arm design, ultra firm, multi-purpose. 3. Multi-angle rotation for your preferred viewing angle. 4. 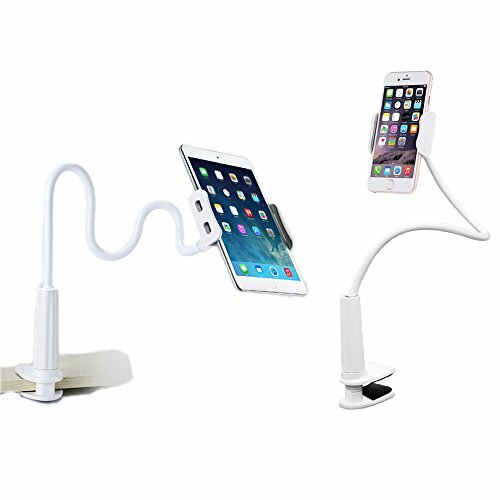 Easy Mount to your car、bed、desktop、sofa and so on. 5. Polyurethane lined grip keeps your phone or GPS safe and secure. 7. Support at the latest, technology mature, more strong! More humanized design! Car use more convenient! Samsung Galaxy Note Note 2 Note 3 Note 4 Note 5 Note EDge / HTC / Lenovo/Huawei/Xiaomi/ Sony etc. 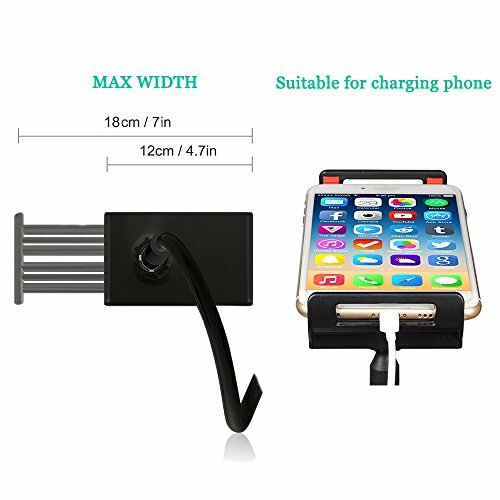 Clip width: Can be extended up to about 9cm/ 3.54"
Can clamp over desktop with thickness not more than 7cm/ 2.76"
This cellphone holder can be detachable which is very convenient to carry and store! It can be 360 degree rotated, which is convenient for video entertainment. With screw locking design on the base, it can be tight nipped easily. Please adjust the shape before fixed. The anti-skid pads on two sides are sturdy and firm and prevents nipped thing from damage. Being tired of holding your phone when watching a long movie in bed? Wanna prepare a delicious meal for your loved one and at the same time follow the cooking program? Trying to do exercise at home while your coach gives you the instruction online? 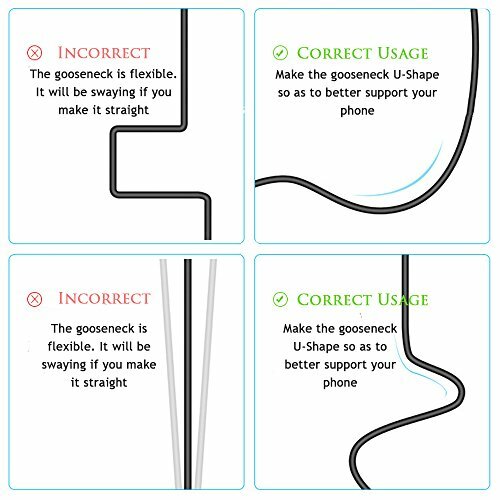 They are not problems as Shenmate Phone Holder would be your great HELPER. 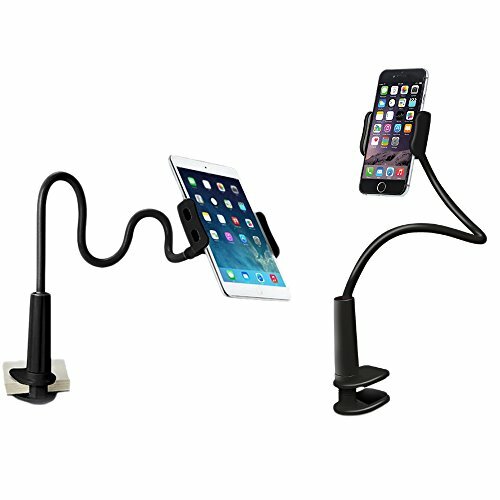 You can put your cell phone in the gripping head of our phone holder. It rotates in all directions. Any suitable angles can work well for you. The width of the gripping head is from 4.7'' to 7''. Make sure your device match before you buy it. [Suitable Size] - The width of our gripping head can extend from 4.7 inches to 7 inches, which is compatible with both your Androids and IOS devices that meet the requirement. 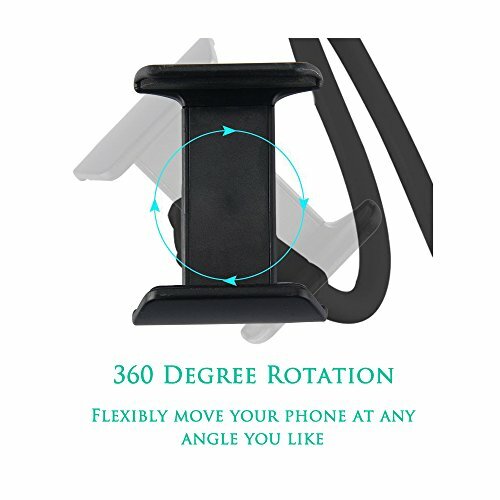 [360 Degree Rotation] - You can rotate your phone into any directions you want with the flexible gripping head. The adjustable angles can make you feel comfortable with your phone viewing no matter what positions you are in. 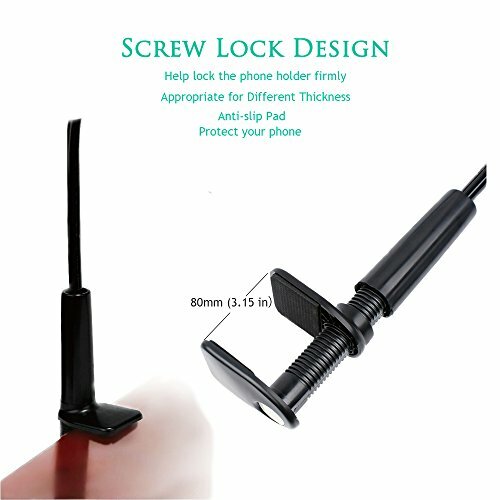 [Screw Lock Pedestal] - The screw lock design, together with the build-in anti-slip silicone pad can help lock the phone holder firmly. Also, the maximum length of the screw lock can reach to 3.15 inches, which is appropriate for desks, tables, shelves and headboards, etc. [Free your hands] - No more hands tiring feeling. Just put your cell phone into our phone holder and you can watch movies when lying in bed, cook when watching an instruction video and exercise when guiding by a coach online. [High Quality Material] - The material of the bracket arm is eco-friendly silica gel. It is corrosion resistance. 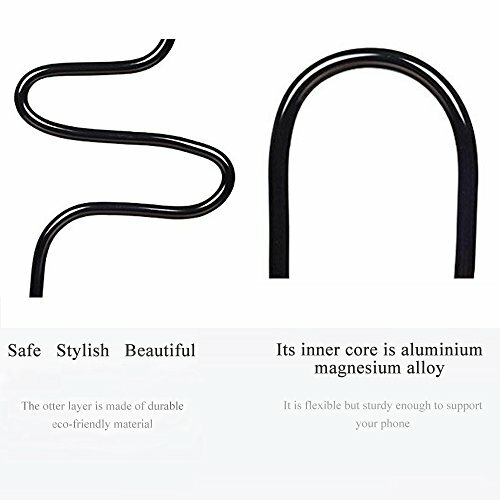 Its inner core is durable aluminium magnesium alloy. 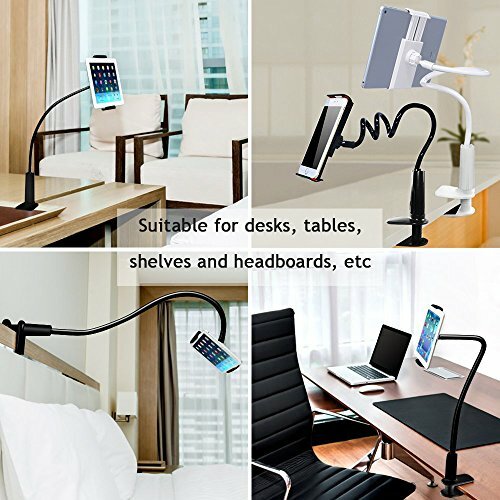 It is flexible but sturdy enough to support your phone. 1. Buyer must inform us within 7 days upon receiving / signing the courier slip, we will not entertain any return after 7 days. 3. You can choose to exchange for another item, or request for refund, we will bear the return postage charges if you choose for exchange another item. For refund process, please refer to below. 4. In case of refund, we will only refund the product amount / value, shipping charges (postage plus handling and other overhead cost ) will not included in the refund, example : If you buy a RM20 product with RM10 shipping charge, we will only refund RM20. 5. Buyer have to re-send back the item to us for exchange or refund, and the postage charge is bear by BUYER even it is a manufacturer defect product, we'll only refund after received the product, we understand that the malfunction product cannot be use, but we also need buyer to send it back to us, this is to avoid buyer misuse of the return policy by keeping the product and at the same time get the refund. 6. We will not bear or responsible if item lost / undeliver / damage caused by the carrier company. 7. For all electronic products , manufacturing warranty period is 7 days by default . If found is manufacturing defect , we will exchange one for you if stock is available . If stock is not available we will refund . 8. All non electronics product , the manufacturing warranty period is 3 days by default after receive ( by proof of poslaju / any courier service post ) . 9. We cannot accept taking difference source of products to compare with our product to judge the product quality . If customer very concern on this , please do not buy here .